The highly anticipated first sequel to The Hunger Games, Catching Fire, joins our Long Range Forecast this week. Vince Vaughn's Delivery Man is also highlighted. - The first film became a phenomenon even prior to release, earning a record-setting $152.5 million opening weekend. - Jennifer Lawrence's stardom has increased exponentially since the first film thanks to her Oscar-winning turn in Silver Linings Playbook. - The original's domestic longevity was also solid, banking a massive $408 million by the end of its run. - Not surprisingly, social network buzz has been consistently through the roof for Catching Fire. - The addition of an IMAX run will boost ticket sales, particularly upfront. - Rarely have first films in a franchise posted multipliers below 3 before seeing their follow-ups go on to outperform them. - Similar to the trend of the first Harry Potter films in 2001 and 2002, curiosity outside the fan base may have peaked with the first film. - Whereas the original flick faced little competition in March/April 2012, Catching Fire will face a more crowded holiday market. - Audiences looking for a comedy won't have many other choices at the time. - Vaughn's Fred Claus opened modestly before enjoying respectable legs during the 2007 holiday season. 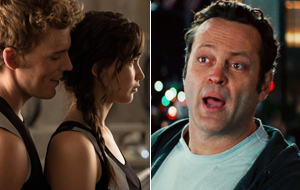 - Vince Vaughn hasn't delivered a box office hit in awhile. The poor performance of The Internship worries us. - Catching Fire will undoubtedly swallow up the film's potential young adult audience. Notable changes on our forecast this week include Gravity (up), Runner Runner (down) and Last Vegas (down). Gravity Oct 4, 2013 Warner Bros. Charging is most important issues now a days,whether this is laptop or mobile but what will you do when your device charger is plugged in but not charger is not supported,So i would like to share this online tutorial https://fixforwindows.com/charging with the help of this you will solve your problem in easy way. I am personally a great fan of hunger games and I would like to give one the best related game to this which is brawl stars apk and mod for your Android.